Annisquam Herb Farm: Sweet woodruff . . .
Sweet woodruff . 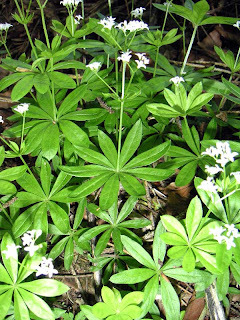 . .
A wonderful ground cover, Sweet Woodruff does very well in the shade under trees and shrubs but will tolerate a position in the full sun as long as the ground does not dry out. The dried leaves can be used in a pot-pourri and as a moth repellent. The leaves can also be used as an herbal tea with gentle sedative properties. As is all things, moderation is the advise of the day when using herbs. According to the blog The Herb Gardener sweet woodruff tastes like a mixture of cinnamon and chamomile. On Mother Earth News the suggestion is made to harvest the leaves during and directly after blooming. Chop up and dry immediately in a warm, shaded area. Plants are available for pick up in Gloucester.